Published on May 30, 2008 in books and photography. 1 Comment Tags: books, photography. I’m not sure how it happened, but somehow I got onto the list for a review copy of Practical Artistry: Light & Exposure for Digital Photographers by Harold Davis. I’m not complaining in the slightest bit, just mystified. I’m a reader of Harold’s blog, and his choice of nature subjects is pretty close to mine, so I’ve always appreciated his photographs. This book is aimed a people who are trying to learn (and subsequently master) the basics of exposure, which puts it squarely in competition with Bryan Peterson’s Understanding Exposure, which is a book that every photographer really ought to read. So how does Davis’ work stand up when compared to Peterson’s? The basic sections are strong, and either book is fine in this respect. I think that Understanding Exposure has more of an emphasis on the creative aspects of photography, and does a better job of helping the reader understand how to achieve particular creative effects by manipulating exposure. In particular, for beginners, Peterson gives stronger guidance on specific values for apertures and shutter speeds, that can be helpful to people that don’t have much of a background. On the other hand, I think that Davis has a much better section on understanding and using the in-camera light meters. I have the revised version of Understanding Exposure, which is updated for digital cameras, but Light & Exposure for Digital Photographers is really much more up to date for the digital age. There is a good discussion on ISO, and how to use ISO as part of the exposure control. Along with that there is an excellent discussion on noise and the use of noise in the creative process. I was glad to find some treatment of white balance. One of the easiest ways to pick out inexperienced photographer’s pictures is to look at the white balancing of the pictures. There is also a chapter on post-processing and RAW processing, a topic to which entire books are devoted, but I think it is helpful for people to understand the role of post-processing in the digital age. As you would expect with a photography book, there are lots of pictures. As I mentioned, Davis’ preference in nature subjects is close to mine, so I really enjoyed the pictures, and there is lots of commentary accompanying each photograph. The photos in Peterson’s book are more diverse in subject matter, which is probably better from a teaching point of view. At the end, though, I like both books. For the stage that I am at photographically, I have a slight preference for Peterson’s Understanding Exposure. I am working hard on the creative aspects of my photography, so I am in a frame of mind to be biased towards Peterson’s treatment. Light & Exposure for Digital Photographers is also a very good book, and I would have no problem recommending it to a beginning photographer. I certainly got something out of reading it (and probably could stand to read each book a few more times). The subject matter in these books is so important that one of these two books should be included in the box with every DSLR sold. Published on May 29, 2008 in community and internet. 3 Comments Tags: community, internet, twitter. So Tim Bray wants to make sure that Twitter stays around, and therefore wants a business model for Twitter. I’d like it to stay around too, which means there has to be a business model for it, but I’m not sure that directly charging people for it is the right model. I don’t have any visibility into Twitter’s economics, but I do have some decent visibility into my usage of the service. All of Tim’s proposals for Twitter are predicated on the notion of wanting to “reach people”. He also cited the classification of Twitter as microblogging, which might be sort of accurate, but which doesn’t capture the whole situation, at least not for me. Random spicy commentary about nothing This is just random information about me, the virtual equivalent of the water cooler at work. These tweets add color, but probably are devoid of directly useful information. Alhough you never know how people might use intimate knowledge of your lunch habits. Social banter One of the twitter tribes that I am in is the local Seattle Flickr tribe. This group is one of the reasons that Facebook became sticky for me, at least for a time. That pretty much stopped when a critical mass of those folks discovered twitter. These tweets are where people are, what they are having for lunch, dinner, etc. They play the role of building a social fabric which is essential for that group to be as successful as it has become. Social arranging This happens because of the SMS Twitter gateway and accessibility of Twitter via mobile devices. Twitter killed whatever usage I might have had on Dodgeball. When I am at conferences, Twitter has become an essential part of the hallway/after hours track. So much so that this usage will drive me to buy a 3G class web enabled telephone, as soon as Jobs announces it. So there are many usages besides “reaching people” in a blogging like sense, and it’s not clear to me that some of these usages would continue if Twitter raised the bar by charging for usage. For the social connections part, reducing the ubiquity of the service is a real negative. The value of Twitter would definitely be reduced by cutting out people who couldn’t/wouldn’t afford to pay for it, like starving aspiring photographers. Published on May 22, 2008 in concurrency, programming and programming languages. 10 Comments Tags: concurrency, dynamic languages, programming. Ted Neward (1, 2) – Ted (how confusing) is in the Scala camp, and thinks that the library approach of Scala’s actor library is preferable to Erlang’s VM (BEAM). He cites managability as a major concern. He also thinks that adapting a process style model into the JVM would be easier than adding SNMP monitoring to BEAM. The length of the Barcelona project bibliography suggests otherwise, but we’ll never know unless some brave soul goes and tries to do this. Fortunately, the JDK is open source now. One has to wonder whether such a change could make its way through the JCP, though. Unfortunately for Ted, I found that many of his arguments were weakened by his lack of knowledge about Erlang. Steve Vinoski (1, 2, 3) – Steve’s articles are more about the reliability aspects of Erlang, and he’s mostly trying to correct Ted’s facts on Erlang. 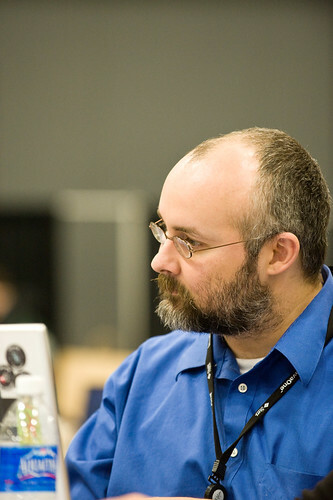 He thinks that Erlang had proven its reliability chops by running for years non-stop. Given the frequency with which Java app servers need to be (or are) bounced, this doesn’t seem that incredible to me. 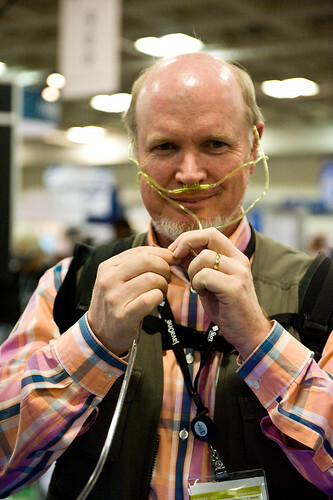 Patrick Logan (1, 2, 3) – Patrick piled on after Steve and has spent most of his writing trying to correct/challenge Ted’s assertions about Erlang. Patrick thinks that the conventional (i.e. JVM and CLR) runtimes will have problems implementing an Erlang style shared-nothing model, since the pre-existing libraries for those runtimes are not engineered in a shared-nothing manner. Barry Kelly was an observer of the Neward-Vinosk-Logan discussion, and added some commentary on the impact of VM primitives on things like lift. This is a point which resonates with me, because it seems to me that both languages and language runtimes will need some work to meet the challenges of large scale multicore computing. Yariv Sadan has done a pile of stuff in Erlang, and supplied his own summary of the differences between Scala and Erlang. There is a very informative exchange between Yariv and lift author David Pollak in the comments of this one. That’s the short rundown. This is a very interesting problem space — before I turned into database programming language guy in graduate school, I was angling to be a concurrent programming language guy. Along the way to that I got pretty good doses of functional and logic programming, as well as actor programming. That work was in the context of people planning to build (for the day) highly concurrent computers, on the order of 1000’s of processors. Today, multicore hardware is not quite up to that level, but it is approaching it pretty quickly. If there is any force in computing that is likely to precipitate the need for a new programming ecosystem (language, runtime, libraries), I think concurrent programming is it. I also think there is just not enough experience with this problem to have a real sense of what is really going to work. Cliff Click and Brian Goetz were right when they said that we just don’t have a good programming model for this stuff. Absent a model, I don’t know how we can think that we really understand what the runtime needs to deliver. Published on May 21, 2008 in java and python. 4 Comments Tags: python. I’ve been asked to moderate a Jython panel at Europython this year, and we are looking for Jython users to be represented on the panel. So if you are a Jython user and you are gong to be at Europython, please drop me a note or leave a comment. Published on May 16, 2008 in books and photography. 1 Comment Tags: books, photography. Learning to lighting has done a lot for my photography. It’s not just gaining a new appreciation for light of all kinds, but also the fact that lit photographs have cause me to think about photographs differently. I used to be a much more reactive photographer – I would just be waiting for moments to happen in order to capture them. Now, I’ve become a little more thoughtful about what I want to the end picture to look like, even in situations that are fairly fast moving. Improving my grasp of composition is definitely something that I am working on. My favorite book on photographic composition was Photographic Composition by Tom Grill and Mark Scanlon. At least it was until I read Michael Freeman’s The Photographer’s Eye: Composition and Design for Better Digital Photos.The entire first chapter is all about framing, which is the most extensive treatment that I’ve seen so far. In addition to a treatment of the usual compositional elements, there’s also a chapter on design basics, which I definitely needed some help with (and probably still do). Perhaps the best chapter of all is the last one on process, where Freeman walks through a case study or two, showing how he prepared and then composed a picture in a photojournalistic setting. Learning someone else’s thought process always seems to yield a bump up for me, much more so than just learning the straight mechanics. Of course, with all things photographic, it’s not enough to read the book and understand it. The trick is putting it all into practice. Published on May 14, 2008 in concurrency, java, programming and programming languages. 1 Comment Tags: concurrency, programming. I stayed around in San Francisco for one more day after JavaOne, in order to attend the Scala liftoff. 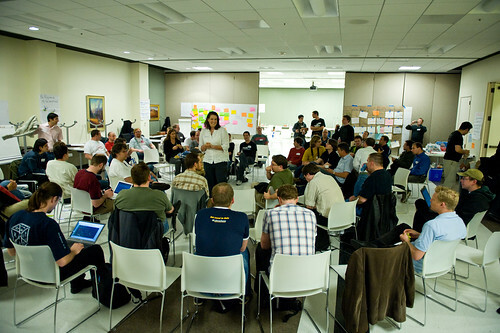 The liftoff was an open space style conference (which has a more specific meaning than “unconference”, at least to me). My friend Kaliya Hamlin did a great job of facilitating the day. Scala has steadily been gaining attention, and hasn’t yet hit (at least in my eyes) the hype part of the classic Gartner hype cycle. I’ve been poking about with Scala, mostly because of the type inferencing, the Actor library, and lift. I have great respect for the work that Martin Odersky has done over the years, which also has me interested. Couple that with what I learned about closures in Java at JavaOne, and the list of reasons to look more deeply at Scala is getting long, especially if you are determined to have a statically typed languages. I wasn’t able to make it to any of sessions on lift. It just worked out that other sessions overlapped them in a pathological way. While this is unfortunate, I am sure that I’ll be able to pick up anything that I need from the mailing lists and other documentation. I was able to attend two sessions on actors. 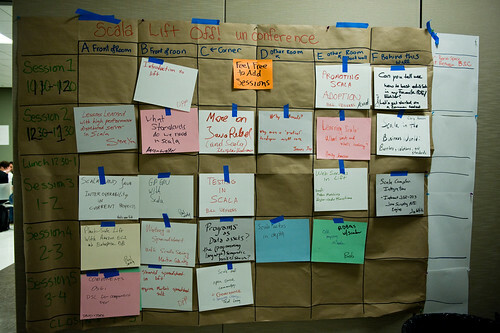 One of the sessions had people with questions about actors, but no Scala actor experts were in that group. There was some discussion of Pi-calculus and the join calculus, but no discussion of the actual actor theory. 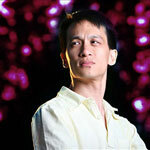 Steve Yen’s session on actor-d was pretty useful. Steve set out to build a version of memcached using Scala’s actors. He spent most of his slot talking about Scala/Java isms that he ran into – this was important since he was comparing to the C memcached. By the time he got to the actor related stuff, he was almost out of time. 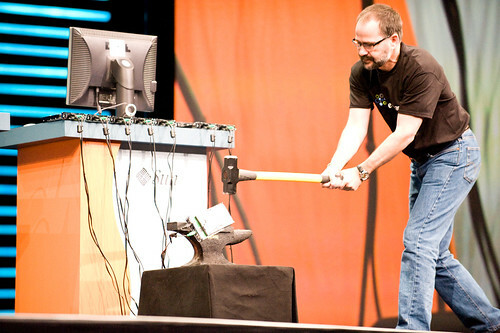 Steve found that he had to remove actors from the main loop of his server in order to get sufficient performance. He wanted to get statistics from the server in the background and discovered that he main loop actor was always processing messages and was never idle long enough to report statistics. He ended up replacing the actor with plain old Java Threads (POJT?). This was in addition to all the fact that he ran into many of the standard Java problems as well. I’m not sure what to conclude from this. I don’t recall what kind of hardware he was on, and I am not convinced that he had the right architecture for an actor based system. Some of his experience also seemed contrary to what the lift folks have been claiming. I think that we are in for a decent amount of investigation here. One of Martin’s statements about Scala is that it is possible (and better) to extend the language via libraries than via actual language constructs. For the most part, I agree with this, but there are certain extensions which have interactions with the runtime – like concurrency. In those cases, I don’t see how the library approach allows taking advantage of runtime features. The current version of Scala actors is implemented as a library. The other session that I participated in was the session on Scala community and governance. Several people wondered about this during Kaliya’s “What questions do you have about Scala” portion of the schedule building. When nobody else put up a session in this area, I grabbed a slot, hoping to spur some conversation – if for no other reason than my own education. Fortunately, Martin had already been thinking about the problem. He is going to adopt a Python style governance, with him (and EPFL) having the final say on language design matters. There will be Scala Enhancement Proposals (SEPs), like the Python PEPs. I’m very happy with this. I think that Python has done very well at maintaining the balance between (lots) of community input on the language design, while still retaining that “quality without a name”. One of the things that I said during the CommunityOne general session panel was that particular individuals in the right place, at the right time, matter at great deal. After watching Martin for the day, and seeing his interactions on the mailing list over the last few months, I think that the design of Scala is in very good hands. We also talked about the evolution of the Scala libraries. The Scalax project is working to build a set of utility libraries for Scala. Martin views scalax as a place where anyone can submit a library, have it tested, vetted, reworked, etc. Eventually some code in scalax would be candidates for addition to the Scala standard libraries. This also seems like a sane approach to me. I like the idea of having a place for libraries to shakeout before going into the standard libraries. Martin also mentioned a LINQ in Scala project. I need to track that one down too. It is good to be in a multi-language world again. There’s room for Scala, Python, Ruby, and others. Another language that I am keeping my eye on is Newspeak. 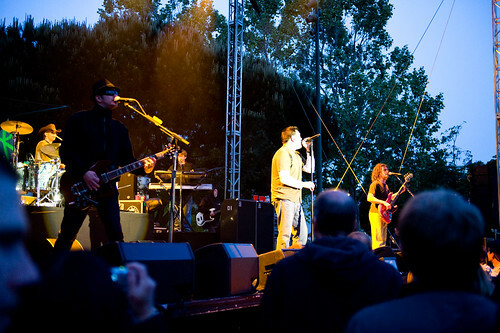 Published on May 13, 2008 in java and Sun. 3 Comments Tags: javaone2008, Sun. I’ve been to so many conferences and seen so many talks that it’s hard for me to really get excited about conference presentations. I went to talks here and there, but nothing at JavaOne was really reaching out at grabbing me (in fairness, this happens at other conferences also, so it’s not just JavaOne). Or at least that was true until the last day. Friday opened with a keynote by James Gosling, who served as the MC for a train of presenters on various cool projects. It’s easy for me (and others, I’d bet) to think mostly of JavaEE or perhaps JavaME when thinking about Java. That’s understandable given the worlds fixation on web applications, and looking ahead to mobile. But the majority of the talks in Gosling’s keynote session had nothing to do with Java SE, EE, or ME (at least in the phone sense). Probably the hit (applause meter wise) of the keynote was LiveScribe‘s demonstration of their Pulse Smart Pen. This is an interesting pen that records the ink strokes that it makes, and any ambient audio that it records while the writing is happening. The ink and audio can be uploaded to a computer, as long as that computer runs Windows (apparently a Mac version is in the works). Unfortunately, the pen works by sensing marks on a special paper (that would be the razor blades), so there’s a limitation on how useful this can be. The presenter said that a future version of the software would allow people to print their own special paper, but that’s still a future item for now. By reading special marks on the special paper, you get a pretty cool user interface. The pen itself can run Java programs, and there is a developer kit available for it. If they can get by the limitation of special paper, I think that this is going to be pretty interesting. Sentilla showed off their Mote hardware, which seem like RFID chips that can run Java programs. except that these RFID chips can form mesh networks amongst themselves and can have various kinds of sensors attached. There are lots of applications for these things, going well beyond inventory tracking and such. 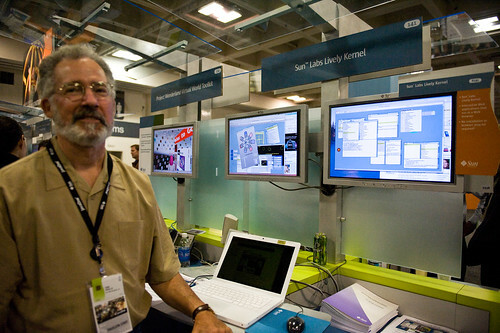 Sun Distinguished Engineer Greg Bollella demonstrated Blue Wonder, which is a replacement for the computers used to control factories. Blue Wonder combines off the shelf x86 hardware, Solaris, and real time Java to provide a commodity solution for factory control applications. This is far afield of Web 2.0 applications, but just as cool, in my mind. By the end of the keynote I was reminded of the long reach of the JVM platform, something that I’d lost sight of. 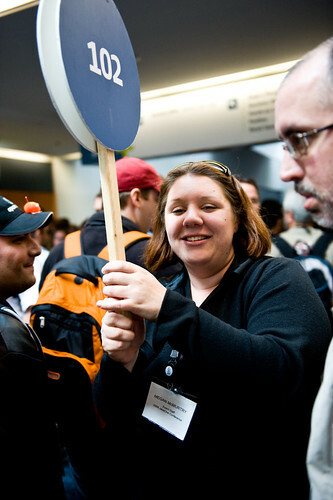 The latest craze in the Web 2.0 space is location data — O’Reilly has an entire conference devoted to the topic. I think that sensor fusion of various kinds (not just location sensors) is going to play a big role in the next generation of really interesting applications. The JVM looks like it’s going to be a part of that. I don’t think than any other virtual machine technology is close in this regard. I also went to a talk on Maxine, a meta-circular JVM. By the twitter reactions of the JRuby and Jython committers, I’d say that Maxine is going to get some well deserved attention when it is open sourced in June. I’m particularly interested because the PI’s for Maxine worked on PJava, and MVM. Given the differences between the Erlang VM and the JVM, I think that the ability to experiment with MVM is going to be pretty interesting. Apparently, there’s already some form of MVM support in Maxine – we’ll find out for sure in June. During the conference I had a meeting with Cay Horstmann, and at the end of the meeting Josh Bloch saw Cay and wanted to talk to him about the BGGA closures proposal for Java. Turns out that Josh has an entire slide deck which consists of a stream of examples where BGGA does the wrong thing, generates really cryptic error messages, or requires an unbelievable amount of code. The fact that BGGA depends on generics, which are already really hard, doesn’t give me much confidence about closures in Java. If you are a statically typed language fan, I think that you ought to be worried about whether Java, the language, has any headroom left. The last session that I went to was Cliff Click and Brian Goetz‘s session on concurrency. Unsurprisingly, the summary of the talk is “abandon all hope, ye who enter here”. I was glad to see a section in the talk about hardware support/changes for concurrency. The problem is that concurrency is going to introduce end-to-end problems, from the hardware all the way up to the application level, and I think that every stop along the way is going to be affected. Unlike sequential programming, where we are still largely reinventing the wheels of the past, there is no real previous history of research results to be mined for concurrency. Hotspot and other VM’s are close to implementing most of the tricks learned from Smalltalk and Lisp, but those systems were mostly used in a sequential fashion, and while there were experiments with concurrency, there was much less experience with the concurrent systems than the sequential ones. Big challenges ahead. Published on May 13, 2008 in java and Sun. 1 Comment Tags: javaone2008, Sun. 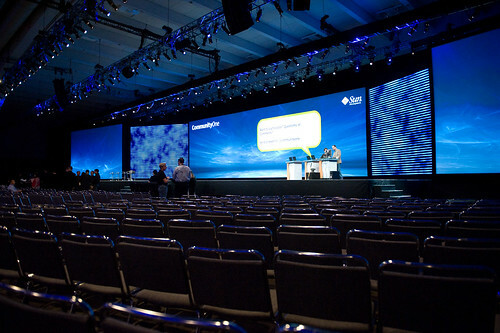 JavaOne is a pretty intense experience, simply by virtue of the size. 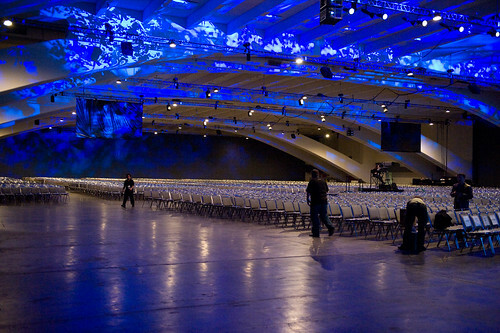 If CommunityOne was twice the size of OSCON, then JavaOne is three times the size of OSCON, and it shows . 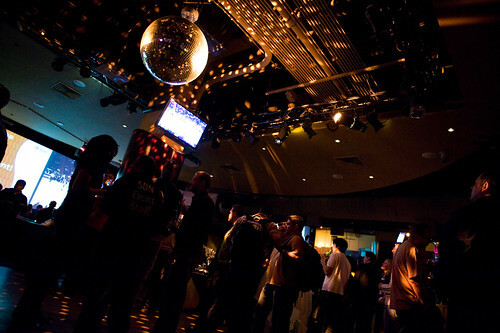 There was an immediate change in feel and atmosphere once JavaOne got into full swing. You could barely move sometimes, and there were a bunch of people whose job was to corral the crowds into some semblance of order. As a Sun employee, I was on a restricted badge, which made it hard to get into sessions (you are basically flying standby). On the other hand, I had plenty to do. I participated in a dynamic languages panel for press and analysts (who have their own track), which was pretty fun. The discussion was lively enough that we could have gone for another hour. There was one persistent fellow who really wanted there to be just one language, or wanted us to declare language X better for task Y. When I got started in computing, people learned and worked in several languages. Its only been recently that a language (Java) was popular enough that people could just learn one language, and the growth of web applications pretty much guarantees a multi-language future because of server side and client side differences. In the end, we’re back to finding and using the best tool for the job, or at least the most comfortable tool for the job. This is probably going to cause heartburn for big IT shops, but developers seem to be happy about it. Unsurprisingly, I got the most value at JavaOne from the networking. And that means dinners, hallway conversations, and yes, the parties. Usually when I go to conferences, I am just a party attender. This time, I also worked at some of the parties. It was a little different to walk around the SDN party wearing a t-shirt with “SDN Event Staff” painted large on the back. I still had a good time. Between the T-shirt and the camera, I definitely had some good conversations. I’ve uploaded the rest of my photos from the conference to this Flickr set. I actually do have some technical commentary, but I am going to put that into another post. Published on May 7, 2008 in open source and Sun. 1 Comment Tags: communityone2008, open source, Sun, twitter, zfs. Live or semi liveblogging conferences has been getting more and more difficult for me to do. The combination of meetings, networking/parties, and photographs means that it takes longer to assemble the requisite material. Here’s a bit on CommunityOne, which took place on Monday. The panel was on community models, although the content was closer to the edge where companies and open source communities meet/collaborate/fight. I think that I had two or three chances to speak, including the final set of remarks before the close of the panel. I have some more thoughts on that topic, but they are deserving of their own post, so that will be showing up after JavaOne is over. 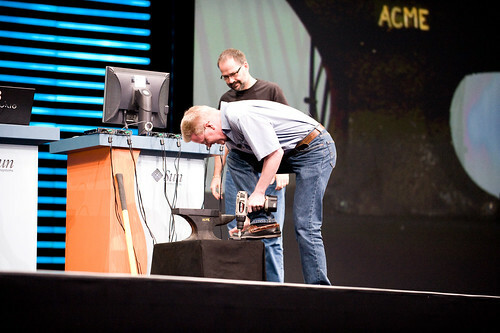 Probably my favorite thing that happened at CommunityOne was the demonstration of ZFS’s reliability in the face of hardware failures. Sun Fellow Jim Hughes has demonstrated this a few times at Sun Tech days, and I’ve been meaning to write about that. I got to meet Jim before the keynote, and I had a very good seat to observe the hardware failure. Jim usually destroys 2 of the drives in the ZFS pool, and it looked like Rich Green (EVP of Software) was going to get to smash the other one, until Jeff Bonwick, the inventor of ZFS, showed up to do the honors himself. Smashing things makes for cool demos – you can watch the video replay if you like.. I’ve been paying more attention to ZFS ever since Theo Schlossnagle sat with me and a few other people in a bar at ApacheCon in Atlanta last year. We were talking about the voracious storage needs of photographers, and Theo was really singing the praises of ZFS. There were so important things that happened to ZFS for OpenSolaris 00805 (which was launched at CommunityOne). The most important is that you can now boot off of a ZFS volume. I hope (but don’t know for sure) that the work that made this possible will make it possible for Macs to boot off of a ZFS volume. My photo storage is getting all fragmented, and I could really put ZFS to good use. I suppose that I could build a ZFS storage appliance based on OpenStorage, but at the moment that is more work that I want to do. 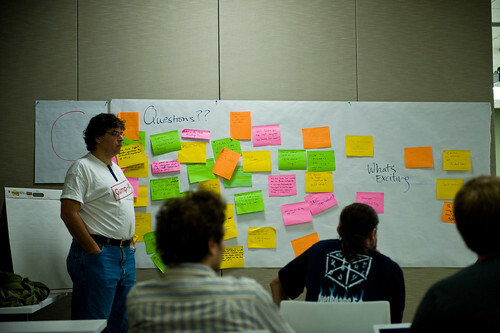 I have a bunch more photos from CommunityOne. At the rate that things are going, I will probably just do a single post on JavaOne. There are plenty of other people doing liveblogging, for those who need a bigger information flow.